Are you a parent educator, physician, social worker or teacher looking for free printable handouts, posters, and class activities? This page collects reproducible resources I’ve developed for use by professionals serving families with children from age 1 to 7. See the bottom of the page for info on copyright, fair use and optional payment. I also have blog posts on all these topics, which you are welcome to link to. Just click on any category in the right hand side bar (or at the bottom of the page on a mobile device). Bookmark this page so it’s easy to come back to it, and/or like my page on Facebook. Developmental Screening: The Ages and Stages Questionnaire is one of the best research-based validated tools, and it’s now available for free online. Your students can complete it on their own or you can do it in class as a conversation starter. Here’s a handout on the Completing the Online ASQ Developmental Screening or here’s my blog post on it. Here’s more info on the ASQ. Brain map is an 11×17 poster showing the different parts of the brain, defining the sensitive periods for their development, and how parents can help. Note, I do not have rights to the brain illustration here, so I would encourage you to use my idea (you’re even welcome to use my text) to make your own poster, with your own illustration. Temperament handout – 4 pages with sources for more information. Or 2 page version. Temperament posters. 8.5 x 11 posters to be posted around the room where parents observe children at play. The posters describe 6 different temperaments, and ask parents to consider what temperaments each child is displaying. Toys and Games for Multiple Intelligences – this is a handout to encourage parents to choose toys and activities that build a variety of skills in kids – it’s not about having LOTS of toys, it’s about having lots of variety in a small amount of toys. Handout on Gender differences, which addresses what the research shows about biological and culturally influenced differences between boys and girls. Gender as a Spectrum which addresses the concept of gender identity, defining your own values about gender, kids who explore alternate gender roles and transgender children. Talking with Children about Gender Identity which adds info on how to talk with a child about gender non-conforming people you may encounter, and how to be supportive of transgender people. Comprehensive Handout on Emotions (7 pages). Sections of the handout broken out: Separation Anxiety, Tantrums, Emotion Coaching. Tantrums and the Downstairs Brain. Tantrums handout with additional info on Daniel Siegel’s concept of the downstairs brain and how children regress developmentally when they are upset. Emotional Literacy. Teaching your Children the Words and Ideas. Parental Anger. All parents get angry in front of their children. If they handle their anger poorly, it’s frightening for children. But, if they handle their conflict well, children learn important lessons. Kid friendships. How to teach skills that help kids make and keep friends. Handout on Play Based Learning. What it is, what children learn through play, and the parent/teacher’s role in enhancing the learning that happens during play. Child Directed Play handout. Focuses on the Floortime method, which is helpful for children with autism, developmental delays or for typically developing children. Posters of Open Ended Questions parents can ask to extend children’s learning. Schemas of Play: These are postcard size “interpretive signs” which can be placed around the classroom for parents to read and learn from as their children play. They talk about types of play such as: Transporting, Transforming & Connecting. Here is an 11×17 Schema poster with the name and icon for each schema. When I play, I am learning. Postcard size signs to place around the room, near activities, that explain what a child learns through playing with blocks, water, etc. Hands On is Brains On: Includes an overview of brain development; how kids need a balance of direct teaching, facilitated play, free play and rest to learn; play-based learning and how parents / teachers support it. Here is the PowerPoint I use when I present this topic. Making Music – the Benefits for Early Learning is a handout about all the developmental benefits of making music – whether that’s shaking bells at toddler circle time, or singing songs at preschool group time, or childhood music lessons. Language Development– 2 page overview handout, with lots of tips for what parents can do to enhance language development. Responsive Language – how parents can enhance language learning not just by talking a lot, but by noticing where the child’s attention is and focusing there. Early literacy – building pre-reading skills with your toddler – what parents can do to lay the foundations for future reading. Literacy age 2 – 6 – similar handout aimed at a broader age range. Raising Bilingual Children – this handout is appropriate both for English speaking families who want to add in an additional language, and for families for whom English is a second language. How to Help Your Child Succeed in School: create an environment which supports learning, set high but reasonable expectations, and connect with your child’s school and teacher. Laying the Foundations for Future School Success – for parents of toddlers. Teaching Early Math Skills for age 1 – 4. Teaching Science Skills for age 3 – 6. Teaching Engineering (Hands-On Problem Solving) for age 1 – 6. Motivation – Handout on understanding your motivation and your child’s motivation to learn a new skill, praise, reward, punishment, and internal motivation. Discipline – Saying No and meaning it. And Saying Yes – Telling your child what TO DO instead of what not to do. FYI, these two handouts work well together. However, do NOT use these if you’re using the Discipline Process handout, as there is overlapping content between them. Consequences and Time Out – the “power tools” of discipline. Self discipline – impulse control, delayed gratification, understanding difference between right and wrong – AND how we help our children learn these things! Discipline Tools You Can Try: discipline tools posters to hang in the classroom / lab setting for parents to read while playing / interacting with the children. And discipline tools postcards for parents to print and use at home as reminders. Words Matter addresses how changing our words can change our interactions with kids – includes praise, shaming, telling kids what to do instead of what not to do, and more. Here’s a much shorter version with a worksheet for students to complete: Words Matter to use in class. One page summary of Potty Training Stages. Longer Handout – includes discussion of praise, punishment, and motivation. Risk-Taking and Safety. For parents of kids age 2 – 8. How we let our kids enjoy and learn from risky play while still keeping them safe. Car Seat 1 page – Is Your Child Ready for the Next Stage – most parents move their kids up to the next level car seat when they reach the minimum age or size. Much safer to keep them in old level until they reach the maximum size for it! Rabbits in the Hole: A book for preschool earthquake drills. Stranger Danger vs. Tricky People: how to reduce your child’s risk of being lost, abducted, or experiencing sexual abuse. long version, short version. Routines: the Importance of Everyday Rituals or Getting through the Day with a Toddler: Routines. These two handouts have similar content, though different tones, so you’d want to pick just one. How Much is Enough, How Much is Too Much: about consumerism and “simplicity parenting”: making choices about what toys to buy, what activities to participate in, leaving free time in the schedule, and a brief mention of screen time. Talking about Cultural Identity and Diversity. Better You than YouTube. Why their parents are the best people for kids to have these conversations with. Talking about differences how to respond when your child notices that others are different from them: race, ability, age, weight, etc. These can be used for a discussion of the couple’s relationship, or most can also be adapted to talking about friendships, relationship between parent and child, and so on. Relationship toolbox Handout and relationship toolbox poster. One sheet summary of relationship skills. Love Languages Quiz – a quiz students complete to determine what love language they “speak” and what love language they “hear”. Based on Gary Chapman’s ideas. Appreciation – a handout on ways to communicate appreciation to our partners and others. Some ideas from Jennifer Louden, some from Gay and Katie Hendricks. Communicating Needs– uses ideas from the “non-violent communication”(aka compassionate communication) method from Marshall Rosenberg to address how to determine what we need and how to ask other people to help us meet that need. Finding Time Together and coming up with ideas for how to use it. Bids and Turns – based on John Gottman’s research about the ways partners respond to bids for connection – by turning away, turning against, or turning toward. Self care and work. Notes for a one hour discussion on self-care and work-life balance. 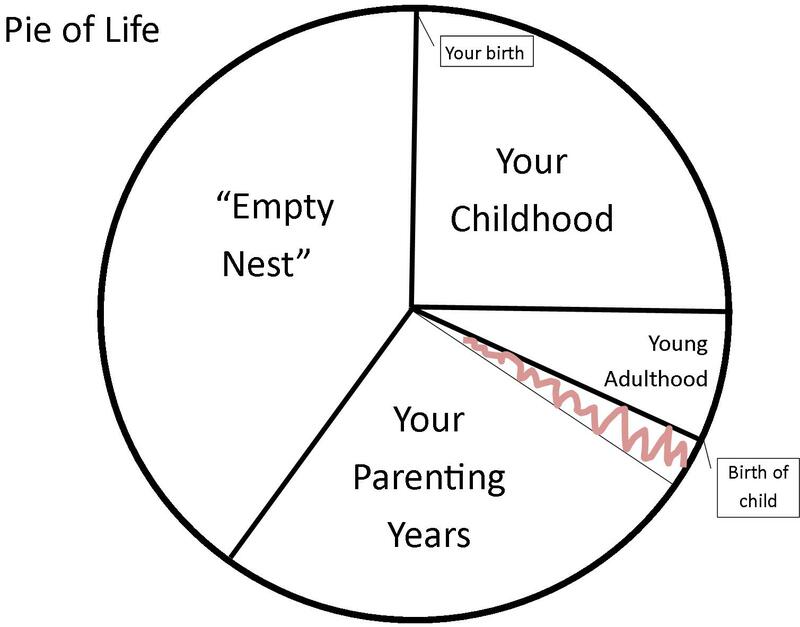 Pie exercise for examining work-life balance, and the Pie of Life image to go along with the discussion. My “Fun with Toddlers” series – a collection of handouts with songs, books, crafts, and sensory activities that tie into seasonal themes and favorite toddler themes. Cheap Dates with Toddlers series – a collection of blog posts with simple suggestions of free or cheap activities to do with little ones. Some are focused on the Seattle area, but most are universal. A webpage of Favorite Songs for toddlers, with links to lyrics, and videos. A collection of Circle Time Songs for Toddlers and a full year’s worth of lesson plans for a toddler Circle Time. My Inventors of Tomorrow blog: hands-on STEM learning for kids ages 3 – 6. Lots of easy, fun, cheap ways to teach science at home or in the classroom. I would love to encourage you to refer clients to the parent education programs at our community colleges! These programs serve families with kids birth to 5. For children, classes offer hands-on learning, discovery and play. For adults, they offer on-going education on all topics related to parenting and also offer connections to other parents. To make it easy to refer, I’ve designed handouts for you! These are handouts for use by childbirth educators, doulas, doctors and midwives, preschool teachers, therapists, and anyone who works with parents of babies and young children. Your options: 2 page handout, the 3 page handout with details. The 1 pager for expectant / new parents. Copyright: All the materials on this site were written by me, Janelle Durham. Fair Use: You cannot sell these materials. You are welcome to use the materials in a class where students have paid for the class, or in other settings where you are paid for your work. You may print them, link to them in emails or from your website. Using Excerpts: If you cut and paste substantial information from my website, please cite me as the author and include a link to the webpage where it was found. Payment: I make these materials available free of charge. But, I do put a lot of work into them, and ask you to consider making a donation to support that work if you are able to do so. How much? If you use my site as a resource as often as you use one of the books on your shelf, and you paid $20 for that book, consider donating $20. If you use my handouts a lot, know that some organizations charge per use. Consider maybe 3 cents per copy used. So, if you plan to distribute 100 copies (or email a copy to 100 clients), that would be $3.00 for a one page handout. Click on the button below, to make a payment in whatever amount you choose.